Let me first backtrack by talking about the weather. Have I told you how much I loathe and detest cold weather? Well, I do. With a passion. So when those first weather reports started to trickle in on social media showing chilly temperatures, a pit of dread formed in my stomach. 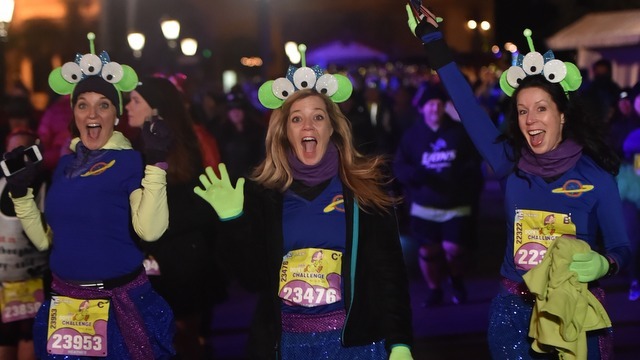 See, when it comes to running and races, there are three things that give me anxiety: Not being trained enough, not knowing how to dress, and cold weather. I had already been on edge about my lack of training due to another injury setback in mid-October. So finding out the races might be super cold? And worrying about how I was going to dress for them? So I must admit to being hardly amused by the many, “Ooooo, I’m loving these colder temps,” type of comments. But at least we had time to prepare, unlike previous race weekends when the cold came in like a sucker punch with no warning. 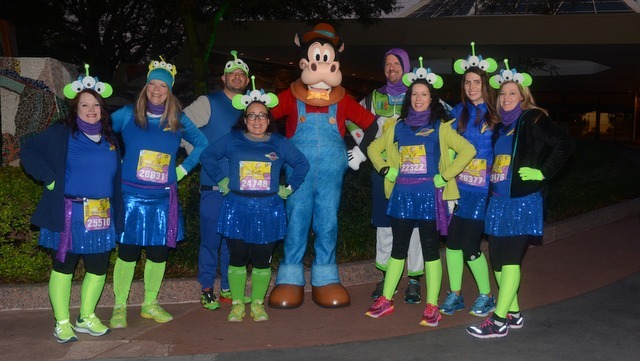 And I have already learned from past experience to always plan alternative base gear for costumes and I’ve also survived the Frozen 5k back in 2015 which was, in fact, quite frozen. Still, this brought on a fresh frenzy of Amazon orders, Wal-Mart runs, and hunts for hand warmers, fleece liners, gloves, and more for the ladies in my room. 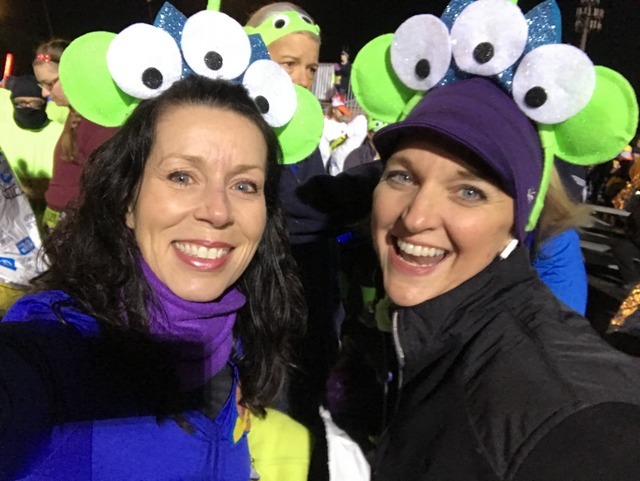 Jackey also made last-minute neck warmers out of fleece that were total LIFESAVERS and coordinated with our costumes. So at least I felt prepared. Not happy about the temps, but prepared. Which brings us back to race morning. 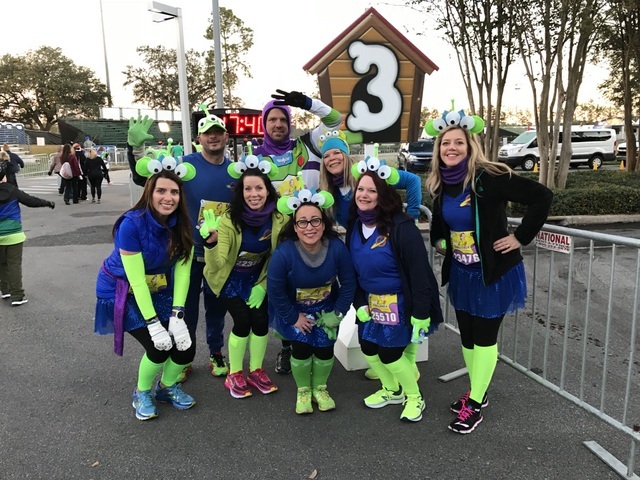 A priority for Jackey, Leslie, Shannon, Rob and myself was getting to each race EARLY so we could get plenty of character pictures! Especially Dopey. We HAD to get a picture with him every morning! Leslie had her van … thank GOD … so she offered to drive each morning. What a blessing! Leaving before the bus service started meant we had zero line at security, no line for Dopey, and then minimal line for Mickey, Donald, and Pluto. 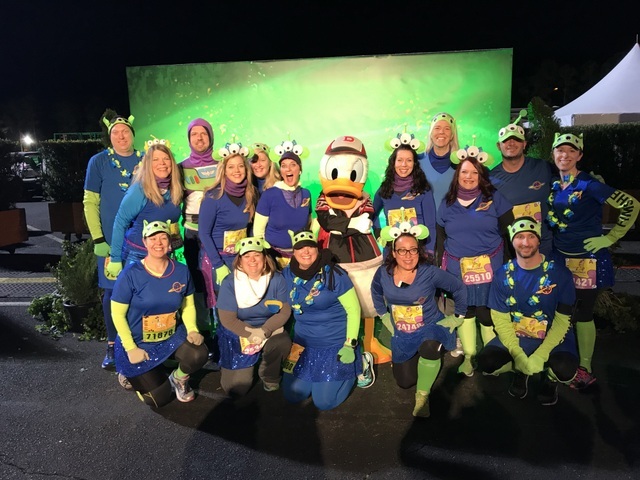 We skipped Goofy and Mickey but we got photos with them another day! Oh and about all those other aliens! 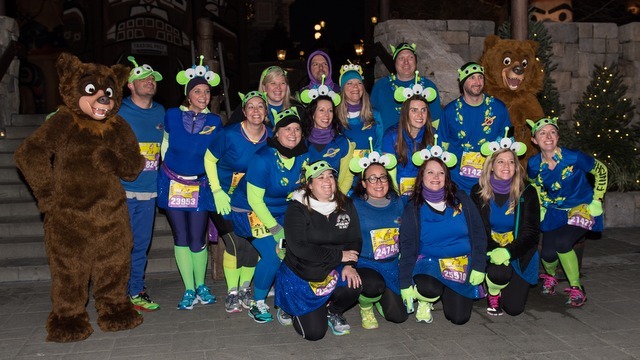 These wonderful folks are members of the Disney running group that first introduced us to the world of runDisney. 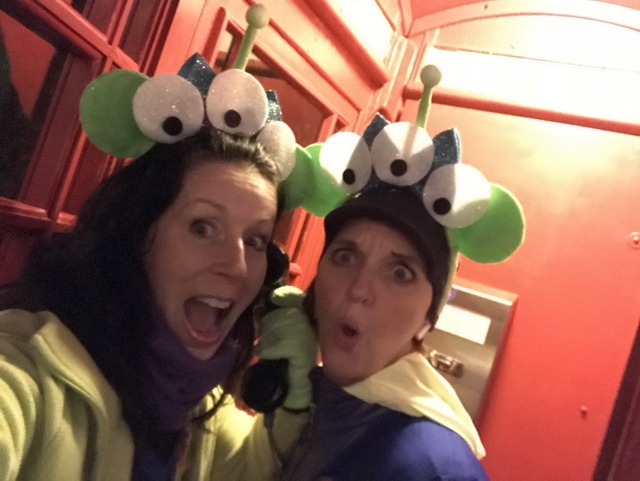 When the idea of us dressing as aliens was kicked around, I was all in! Gorgeous bright colors? Easy to put together? A chance to bond with amazing people? Okay! Christopher did a fantastic job with his claw costume, our leader. 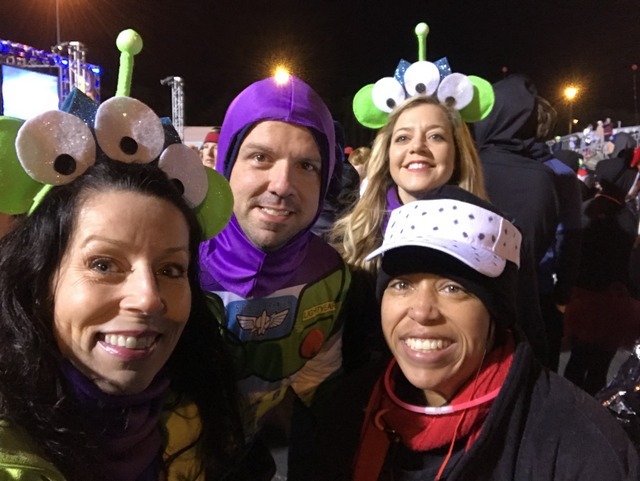 Rob opted to go as Buzz Lightyear which pleased him greatly since he was able to layer clothes underneath. 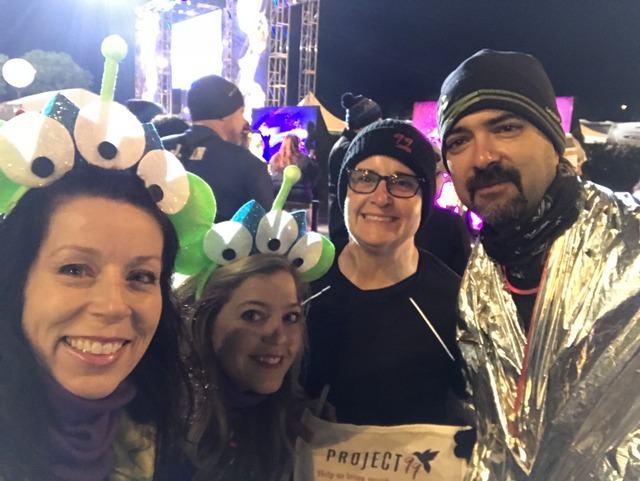 My friend Heather from Running with Grace joined in the fun and ran most of the race with us. It’s always a blast hanging out with her! 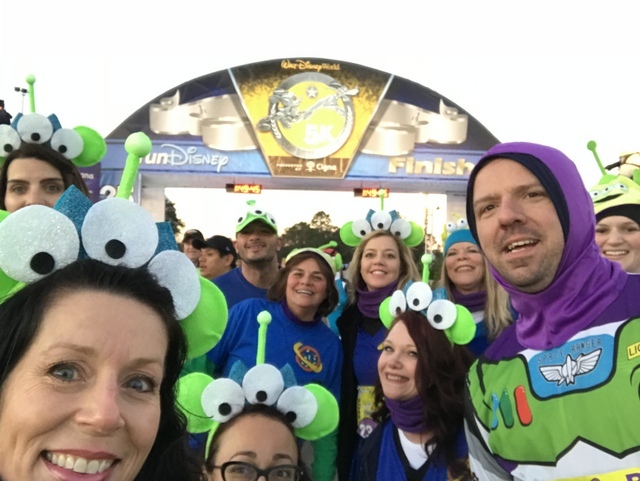 It was also amazing getting to say hello to many Joyful Mile viewers and podcast subscribers! That always puts the biggest smile on my face, when folks take the time to stop by. Many thanks!! 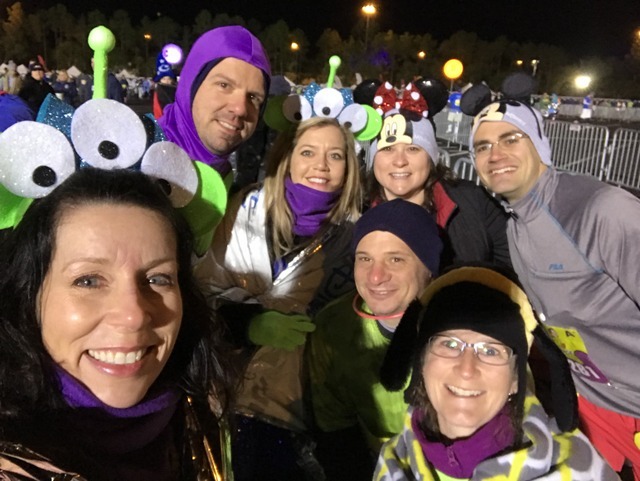 We weren’t in a big hurry to get to the corrals since we were feeling pretty frozen and being near the front wasn’t a priority. I tried to get plenty of footage for a video recap, but pulling my double layer of gloves off my thumb was far too painful, so some expectation adjustments were necessary! Oh and have I mentioned feet warmers yet? Jackey’s friend, Josh, had given us both some and they were AMAZING!!! Total life savers … or should I say feet savers? Jackey took hers out before the race but I left mine in which could have been a mistake but I didn’t really care. Nor did I pay much attention to Rudy and John’s pre show. 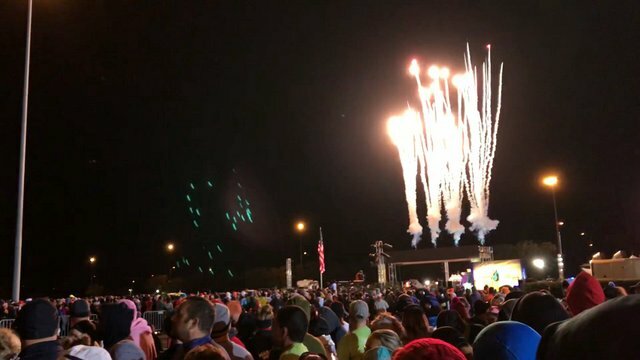 I just wanted to MOVE so I was more than happy when the first fireworks went off for the wheelchair division, followed by the three waves for Corral A! 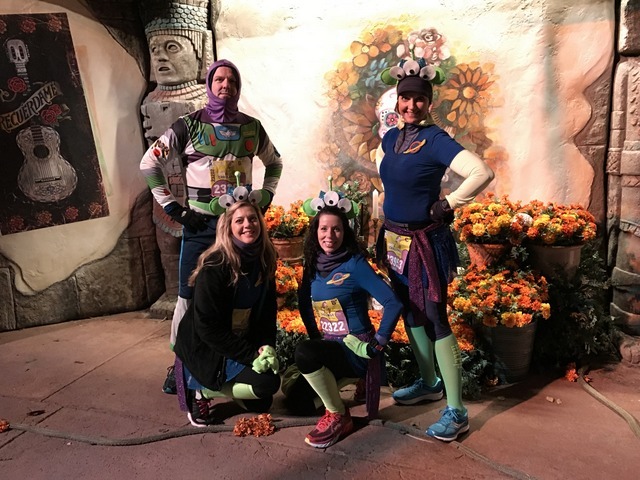 Once we finally got to run and made it to the parking lot, I couldn’t help but laugh at how stiff and robotic we looked from half-frozen legs. I don’t think I thawed out until the first mile marker. Chip and Dale were near the backlot of Epcot, but there was a huge line formed already so we decided to give that a pass to keep our legs from stiffening up again. Rob had plans to eat breakfast at Garden Grill on Monday, (something we all ended up doing,) so he knew he’d see them later. At the entrance of World Showcase’s Mexico, however, we did have to stop for a quick photo by the Coco backdrop! You can’t tell in this photo, but it was quite stunning. And how could we not get a quick Spaceship Earth photo? One thing we did bypass, however, was the first water station. The thought of drinking something cold was enough to make me cry. I had also stuck with my pre-race tradition by drinking 16 ounces of Gatorade as soon as I woke, so I wasn’t worried about hydration. Hypothermia? Yes. Hydration, no. The line for Jimminy Cricket was HUGE but us ladies had to pee, so Heather and Rob waited in line while Jackey and I went to the WORST SMELLING BATHROOM EVER!! Oh my gosh. That is no exaggeration. There must have been some serious septic issues going on. Thank goodness for our neck wraps. We both pulled them up over our noses and made the world’s fastest pees. The problem with multiple layers is the multiple time it takes pulling things ups and getting everything situated. So I was quite happy to get out of there! 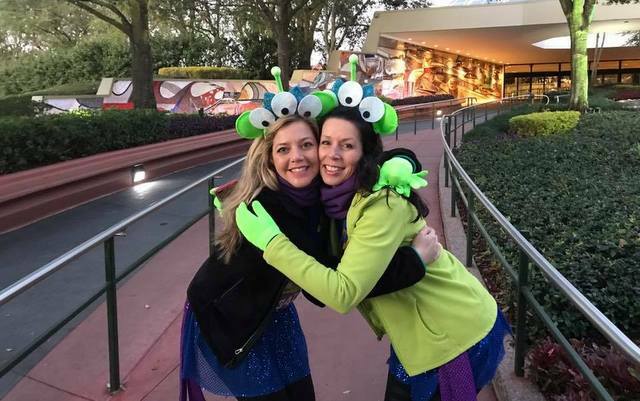 And I was also happy to see a ton of aliens heading our way while waiting in line for Jimminy, including Shannon, Leslie and Kimberly! 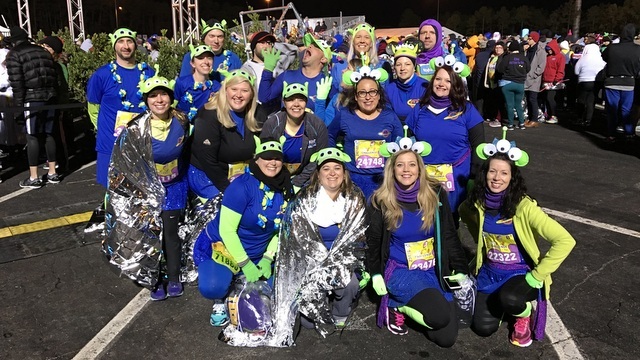 We pretty much all stuck together for the rest of the race, making things extra fun. The character lines were super long, though, so Heather and I decided to charge forward and get in line for everybody. This is totally fine if you get a group photo but not cool for additional individual shots. Despite our rush, we still had to get a phone booth picture outside of Canada. Just because. The next character photo ended up being Kenai and Koda from Brother Bear. Our sprint didn’t get us far with the line, but it felt great opening up and running fast! 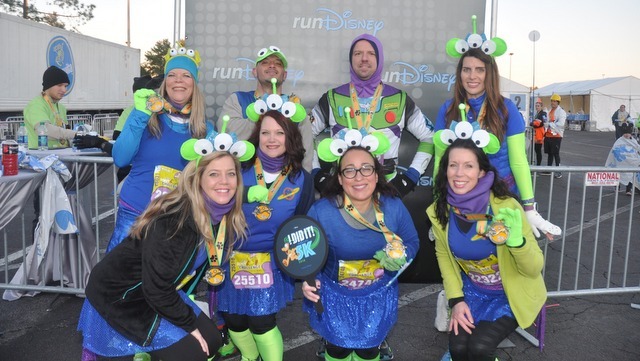 And the picture … it ended up being in runDisney’s video! 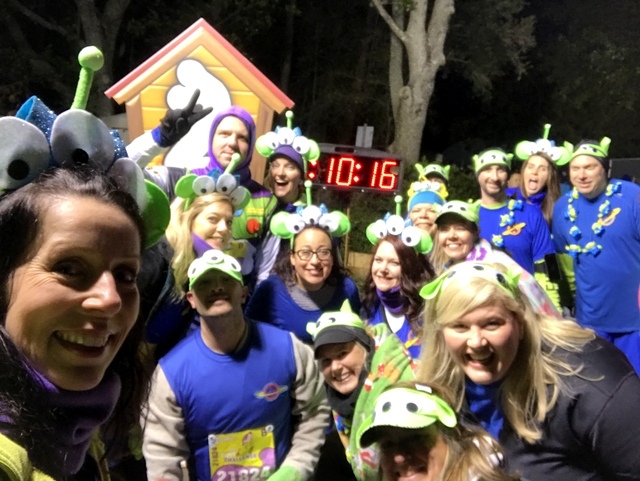 Another runDisney bucket list item checked off! We then headed toward Future World, veering off to the loop near Soarin’ for one last character picture. A cast member had previously told us it’d be Clarabelle, but it was still awesome seeing Horace! Argh, I should have tossed that jacket. Shoulda, coulda, woulda. Jackey and I did get our traditional huggy pose, though! 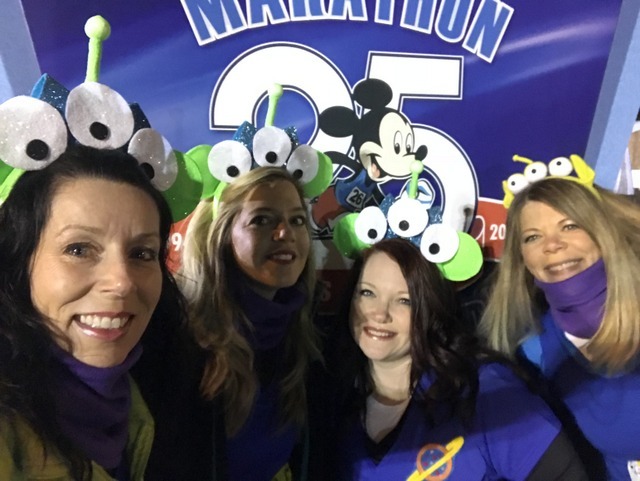 We then headed back toward Spaceship Earth and the Mile 3 mark! Oh and speaking of amazing … look at Cindy Copley’s fantastic costume!! I’m continually blown away by this gal and her amazing talent. If you haven’t checked out Copley Couture on Instagram, do so right away! 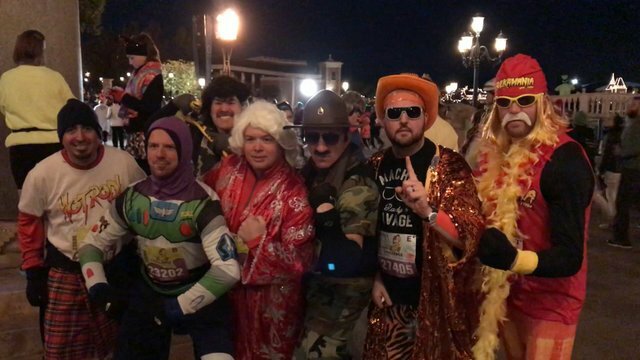 And speaking of costumes, Rob completely geeked out when he saw this awesome group of guys dressed as WWE Wrestlers! They NAILED it!! We then headed to Epcot with the intention of taking a spin on Test Track, but it was closed. Maybe that was a good thing considering how cold that 60mph voyage around the track would be! Instead, we waited in standby for Soarin’ … which was so relaxing and comfy that I nodded off a few times. Turned out, I wasn’t the only one! Afterward, we were starving so we headed to Sunshine Seasons for breakfast. I was already a huge fan of dinner there, so it was a pleasant surprise to discover their morning menu was just as great! Rob and I did get a beer … which might have looked odd to others. 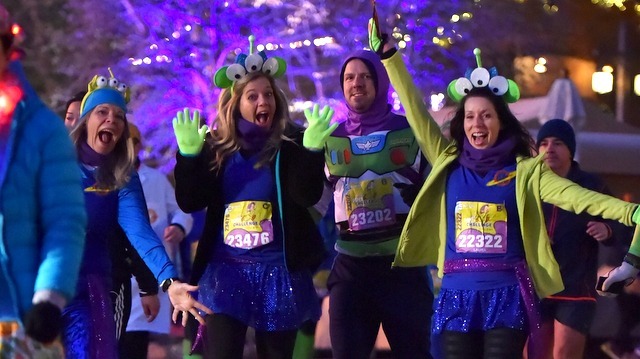 But then again, we were all dressed as Buzz and aliens with gigantic ears on, so things were odd enough already. 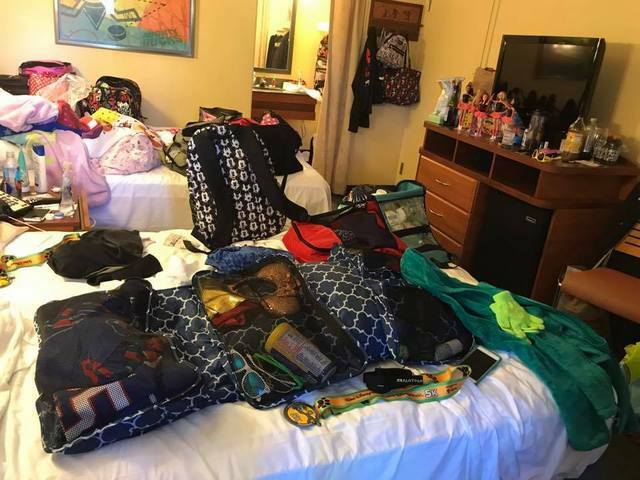 We then had to hustle back to All Stars Movies in order to pack and make the move to Animal Kingdom Lodge … something none of us were happy about but was necessary! I mean, my gosh. Look at this mess! That dingy lime green jacket! Again. Shoulda, coulda, woulda. But the thought of parting with it made me cry more than drinking water. 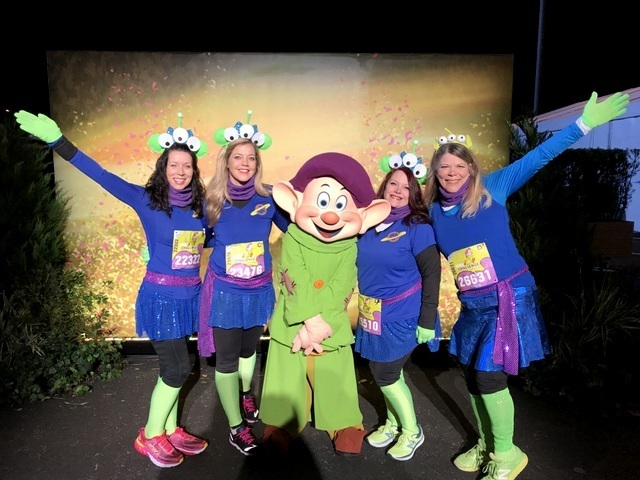 So there you have it, my 5k experience and day 1 of the Dopey Challenge! If you’d like to see the video version, here you go! Now what about you? 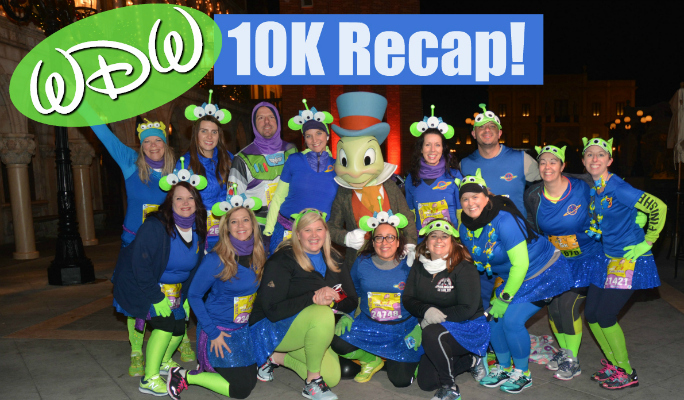 QOTD: Did you do runDisney’s WDW 5k and if so, what was your favorite moment? 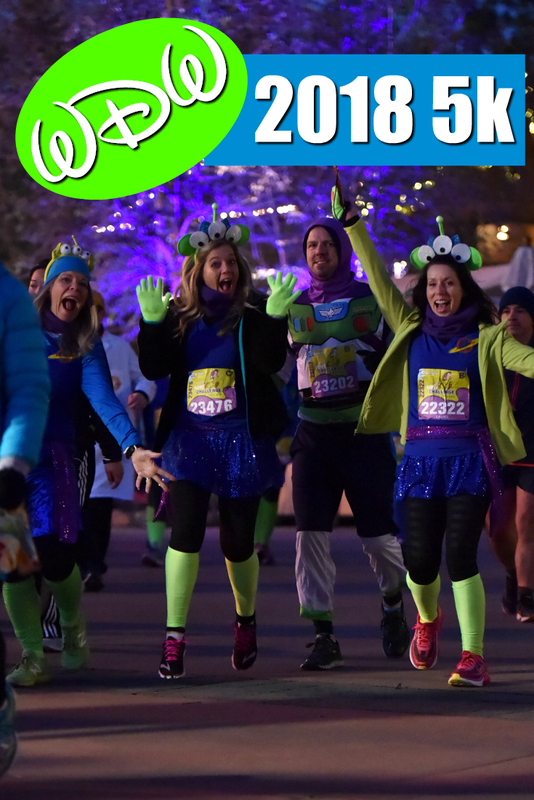 Next up, the 2018 WDW 10k! Thanks for reading and have a joyful day! That 5K was COLD. 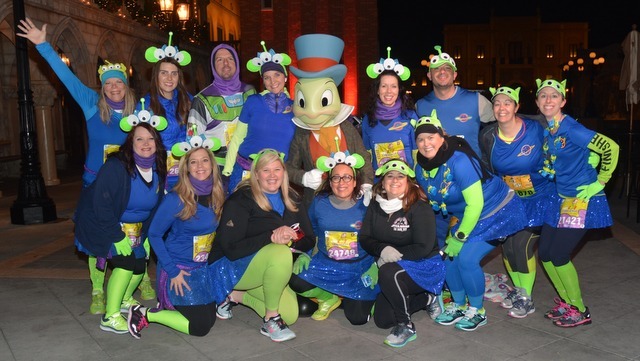 I had a cute Alice in Wonderland Costume all planned but didn’t take off my running coat the whole race, so all you could see were my rabbit ears! I totally saw you guys, yelled “JOYFUL MILES” and waved and then got a little starstruck and couldn’t think of anything else to say! 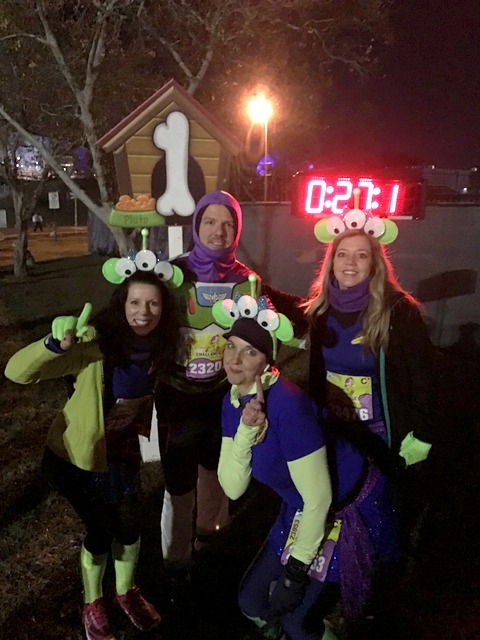 You guys are runDisney celebrities! Oh no, sorry we didn’t hear you!! I would have made you get a selfie with us. And good grief it was SO COLD!!! 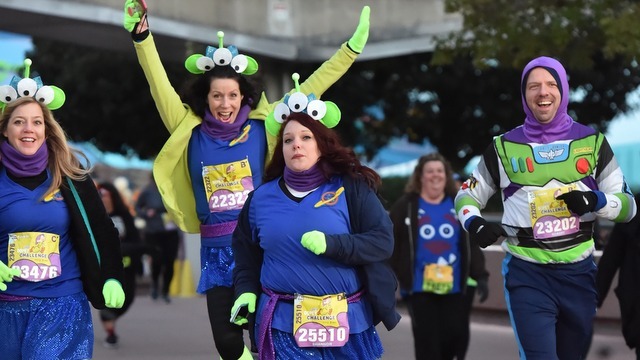 But now you’ll have that super cute Alice costume to wear for another race. 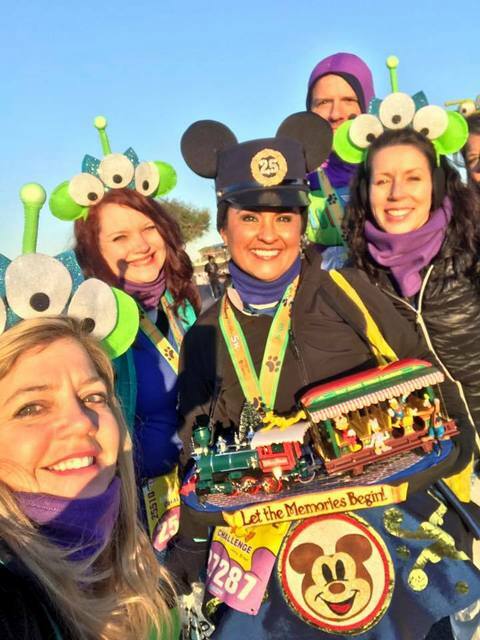 Thanks for taking the time to snap a picture of myself and Michelle McCarthy and posting it our your site (picture #8 above), We met in line for pictures for Dopey on the first day of the Dopey Challenge. We are both fans of Joyful Miles and love the work you guys do on the podcast. 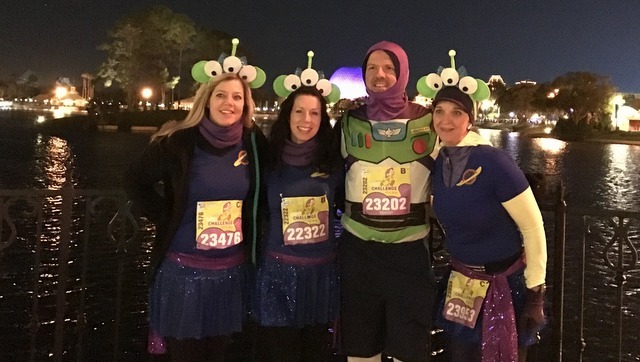 I need to meet Robert because like me, he spends lots of time running with Disney inspired women. So glad we were able to meet both you and Michelle! And thanks so much … we enjoy doing the podcast and love knowing that it’s helping others. 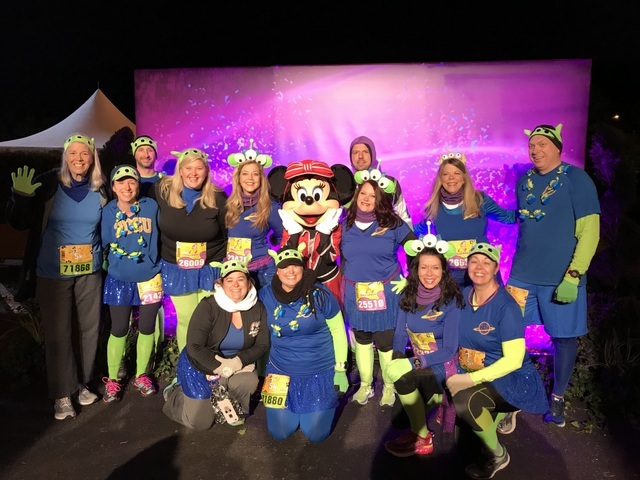 Previous post: runDisney’s 2018 WDW Marathon Weekend: The Expo!